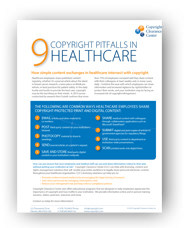 Healthcare employees share published content as a matter of business and the last thing they probably think about is copyright. Combine the ease with which employees can share information and the increased vigilance by rightsholders to protect their works, and your organization may be facing an increased risk of copyright infringement. Materials available on copyright.com are protected by the copyright laws of the United States and other countries. © 1995-2018 Copyright Clearance Center, Inc. All rights reserved.